Help make the holidays brighter for children and families in need. The Miami-Dade Parks' Marina Operations is asking for donations of new unwrapped toys, clothes, and canned foods. Items can be brought to the dockmasters office at Black Point Marina. Donations will be accepted until December 13th. For more information, read the flyer. December 7th - 28th. Last years popular Holiday bus for seniors has returned. The bus service will run on Monday, Tuesday, Thursday and Friday from 10am until 4pm, excluding December 25th. This free service takes riders along a 14 mile route between senior living facilities and retail shopping areas on Old Cutler, US-1 and Southland Mall. For more information contact Town Hall at 305-234-4262. The bus service is being sponsored this year by HealthSouth Rehabilitation Hospital and Sunstate Bank. Thursday, December 10th from 7 to 10pm. Celebrate the season with wild lights, a winter wonderland, holiday music, dancing, complimentary hot chocolate and cookies. Also available "Bites for Bucks", a cash bar, snowtinis, a holiday tree raffle and much more. Cost is $9.95 for zoo members, $10.95 for non-members. Visit miamimetrozoo.com for more information. This Saturday, December 12th, starting at 7pm. Join your neighbors in celebrating the 15th Annual Cutler Ridge Boat parade. The parade takes place along the Bel-Aire Canal in Cutler Bay. Residents can get a good view of the parade from the Marlin Rd bridge (at Bel Aire Drive), or the foot bridge located at Bel Aire Drive and Cutler Ridge Drive (near Cutler Ridge Park). See the map for locations. Saturday, December 12th from 10am to noon. Children of all ages are invited to listen as Santa Claus reads some classic holiday stories next to the Christmas Tree at the Deering Estate's Stone House Ballroom. After story time, children are invited to participate in an arts and crafts activity. Bring your camera and get a picture of your child with Santa or have one done professionally for an additional fee. General admission to the Deering Estate is $10 for adults and $5 for children (ages 4-14). For more information visit www.deeringestate.org. Saturday, December 12th, beginning at 7:30pm (doors open at 7pm). Enjoy an evening filled with the sounds of spirited Christmas music performed by an array of musicians. This free concert takes place at Old Cutler Presbyterian Church, located at 14401 Old Cutler Rd. For more information contact David Hillbery at 305-238-8121 X327 or email him at david@ocpc.org. Sunday, December 13th, 4:30 pm. In celebration of Hanukkah, the Chabad of Homestead and Cutler Bay will host a menorah lighting ceremony at Cutler Ridge Park. In addition, there will be activities for the kids and refreshments served. December 18-19th at 8pm and December 19-20th at 2pm. The Theatre Institute of South Florida will be resenting "Annie Jr." based on the strip "Little Orphan Annie". Tickets are available online for $12.00 or at the door for $20.00. For more information, call the Miami Science Museum at 305-646-4200 or visit miamisci.org or thetheatreinstitiute.com. The museum is located at 3280 S. Miami Ave.
Saturday, December 19th from 7-9pm. Kids, bring your parents to meet Santa. Enjoy a holiday meal with your family at Wings of Asia, watching the aquatic birds. Price is $24.95 for adults, $22.95 for children age 3-12. Space is limited so reserve your seat today. For more information visit. On Sunday, December 20th, from 2-4pm (arrive by 1:30). Take a cruise on the "Pelican Island Skipper", a 45-foot catamaran, as you explore the waters of Biscayne Bay. Learn about birds, sea mammals, Native Americans and early pioneers. The cruise is open to all ages at a cost of $35.00 per person. To reserve your space, call 305-235-1668 ext. 233. For more information visit deeringestate.org. 7pm-11pm, Friday, Saturday, and Sunday nights beginning November 27 through December 20. Metrozoo celebrates the season with animal shaped lights, a Festival of trees, holiday songs, and hot chocolate. Admission is $7.95 for adults $5.95 for children 3-12. Visit metrozoo.com for more information. The following events take place at the South Dade Regional Library, located at 10750 SW 211th St. Call 305-233-8140 for more information. Notice: The South Dade Regional Library will be closed for repairs on Saturday December 12th and Sunday December 13th. The library will reopen on Monday at 9:30am. Friday, December 11th, 9:30 am. Register now for AARP's Driver Safety Program. This program for both adults and seniors will teach safe driving techniques which may save you money on your insurance. Registration is required to to limited space. Contact T. Laughlin for more information at 305-382-5331. Wednesday, December 16th, 3:30pm. Deck the Halls for the Winter Holidays. Children 6-12 can make decorations for the holidays. Thursday, December 17th, 7 pm. Momentum Dance Company presents Red Riding Hood. This children's classic is told through music, dance and narration. From December 1st-24th. Help spread Christmas joy. Bring a new, unwrapped toy to the Toys For Tots kiosk located in the Food Court and Life Church will gift wrap your gifts for free. Sunday, December 20 from 6-8 pm. It's "Pet Night" at the mall. Bring your pet in for a photo with Santa in the Sears Wing of the mall. All pets must be leashed at all times and will have limited access to the mall. Tuesday, December 1st, at 7pm. The members of the Concerned Citizens will be having a potluck social this month. Members and guests alike invite you to celebrate the holiday season by bringing a favorite dish to share. The meeting takes place at Cutler Ridge Park, located at 10100 SW 200th St. For further information, contact Freddie at 786-252-2798. Friday, December 4th from 7–9pm (gates open at 6) Kick off the Holiday season with the Deering Estate's 3rd Annual Tree Lighting ceremony in the historic Stone House Ballroom. Enjoy live performances of your favorite holiday music. General admission to the Deering Estate is $10 for adults and $5 for children (ages 4-14). For more information, visit www.deeringestate.org. Saturday, December 5th from 7-10pm (gates open at 6). Bring your blankets, lawn chairs and small picnic baskets (no coolers please) and enjoy this outdoor concert. Tour the historic houses beautifully decorated for the season. For additional information, call 305-235-1668 ext. 233. Sunday, December 6th from noon to 4pm. This months family event features two performances by Chasing Tales Improv Troupe. Make a bird feeder for your yard or take a nature walk. Kids can also get their face painted. On December 6th, at noon, Bet Shira will be holding a holiday bazaar featuring items such as jewelry, handbags, housewares, ceramics, toys and gifts for the holiday. Bet Shira is located at 7500 SW 120 St., in Pinecrest. For more information, phone 305-238-2601. According to the Miami Herald, The Brotherhood of Love, an organization that helps needy families in Naranja, Goulds, Perrine and Modello, is seeking donations for Thanksgiving meals. They are asking for donations of turkeys, hams, green beans, cabbage, potatoes, candied yams, sweet potato pie, cakes, and paper goods. The meal will take place on Thanksgiving, from noon to 6pm at 10621 SW 173 St. For more information, call the groups Founder, Gary Johnson, at 786-200-0094. On Sunday, an accidental shooting took place within Cutler Bay that took the life of one of our young residents. Samantha Jo Meerbott, 14, a freshman at Southridge High School, died Monday morning. On Wednesday, November 24th, at 7p.m., the Southridge High School drama department and dance team students are preparing to hold a benefit performance at the school. All proceeds will go to the Meerbott family. Click here for more information. On November 20-22nd from 9:30am–4:30pm. This 69th annual event includes: plants for sale, live music, arts and crafts, antiques,collectibles, old and rare books, art and “Kid Way”, an eco-village. Enjoy live music and a chance at winning one of 60 items to be raffled. The event takes place at Fairchild Tropical Garden, located at 10901 Old Cutler Rd. Call 305-667-1651 ext. 3344 for additional information, or visit www.fairchildgarden.org. Saturday, November 21st, parade begins at 4pm. This annual parade at The Falls features Santa Claus, marching bands, antique cars and costumed characters. The festivities continue throughout the evening with three stages featuring music and dance. For more information, visit simon.com/mall/default.aspx?ID=1232. Saturday and Sunday, November 21-22nd, beginning at 10am. (Early bird shopping at 8am for an additional fee.) Come to the Historical Museum of Southern Florida's annual fund raiser. This major indoor festival features homemade crafts and artwork, live music and great foods. Enjoy the model trains, vintage automobiles and much more. The event takes place at the Miami-Dade Fair Expo, located at 10901 Coral Way. Visit their website at miamiharvest.webs.com for admission fees, $2.00 off coupon and more information. Monday, November 23rd at 7:00pm. 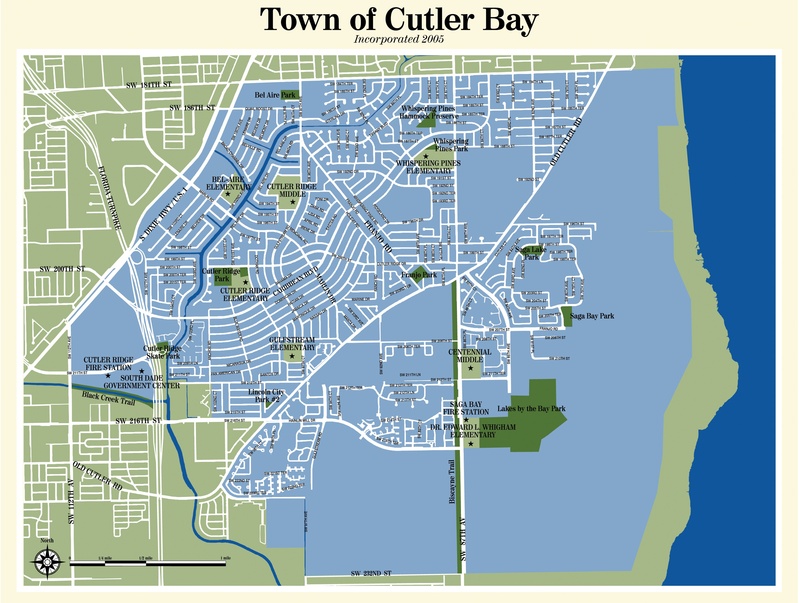 Cutler Bay's State of the Town address will be given at Centennial Middle School Auditorium, 8601 SW 212th St. (map). Find out what the town has accomplished and what the plans are for the future. November 14th and 15th from 10am-5pm. Visit the Redland Fruit and Spice Park for this Eco-friendly festival. The event includes a local and organic farmers market, alternative energy exhibits, herbs, oils and teas, natural foods and culinary plants. Enjoy live music, and children's activities. Take advantage of services including aromatherapy, yoga, Tai Chi, Reiki, and chair massages. Admission is $8.00, free for children under 11. For more information, call 305-247-5727. The Redland Fruit and Spice Park is located at 24801 SW 187th Ave., in Homestead. November 14th, beginning at 8am. For great family fun join your neighbors for a 10.6 mile bike ride through the Town of Cutler Bay. Registration is from 8:00-8:30am., with a "safety rodeo" at 8:30. The ride begins for participants 12 years old and up at 9am. Younger kids will participate is a shorter, supervised ride, then there's face painting and a puppet show. The ride begins and ends at the clubhouse at Isles of Bayshore, 21864 SW 93rd Path (map). Helmets are required. For more information, phone town hall at 305-234-4262. On Saturday, November 14th, from 8am-3pm, Holy Rosary Catholic Church will be holding a flea market. This venue provides a great opportunity for residents sell their unneeded items. For booth information, call 305-345-1683. Holy Rosary Church is located at 18455 Franjo Rd. Saturday November 14th from 7pm-11pm. The Rotary Club will host it's 6th Annual Casino Night at the Palmetto Bay Village Center. There will be a silent auction, or try your luck at Blackjack, Roulette, Craps, Slots, and Poker. Tickets are $50 each, redeemable for 20 gaming fun chips, hors d'oeuvres, and 2 drink vouchers. Palmetto Bay Village Center is located at SW 184th St. and Old Cutler Road. Proceeds benefit the Rotary Club of Perrine-Cutler Ridge/Palmetto Bay. For additional information or to purchase tickets, visit pcrpbrotary.org. The Rotary Club will be raffling off a 4 night, trip for 2 at the Bellagio hotel in Las Vegas. Trip includes round trip airfare and Limo transportation from Miami. Tickets are $10 for one, $50 for 6, or 12 tickets for $100. To purchase tickets or for more information phone Maria Kesti at 305-323-1530 or Francine Tegzes at 305-252-0367. Drawing takes place on November 14th during the Casino Night event. You do not need to be present to win. For more information, visit pcrpbrotary.org. Saturday, November 14th from 8am to 4pm. Perrine-Peters United Methodist Church will be holding a craft fair and silent auction. The Church is located at 18301 S. Dixie Hwy. Phone 305-235-2309 for additional information. Saturday, November 7th from 11am-10pm and Sunday, November 8th from 11am-6pm. Miami-Dade Parks presents Ribfest 2009, a 2 day outdoor event featuring live music, a motorcycle rally, arts and crafts vendors and a play area for the kids complete with games, bounce house and petting zoo. Enjoy carnival games, classic car show, horse show and of course, lots of ribs. Musical guests include Joan Jett and the Blackhearts along with Blue Oyster Cult both appearing on Saturday. Sundays musical guests are Tracy Laurence and Chuck Wicks. Admission to the event is $10.00, free for children under 10, with a $5.00 charge for parking. Ribfest takes place at the Homestead Air Reserve Park, located at SW 268 Street (Moody Drive) and SW 122 Ave in Homestead. For more information visit miamidade.gov/ribfest or call 305-668-4343 ext.224. November 7-8th from 9am-5pm (no admittance after 3pm). Come to the show and see two days of spectacular flying feats, including the Thunderbirds. Watch biplanes, supersonic jets and rocket cars along with aerobatic and wing-walking routines. In addition, see both classic and vintage aircraft up close along with military vehicles. Enjoy a variety of foods, beverages and memorabilia vendors. The event takes place at the Homestead Air Reserve Base, located at 29050 Coral Sea Blvd,,Homestead,. For more information visit, wingsoverhomestead.com. November 7th and 8th from 10am-4pm. Visit Cauley Square for their 7th Annual Holiday Arts and Crafts Fair. For more information, visit cauleysquare.com or phone 305-258-3543. Cauley Square is located at 22400 Old Dixie Hwy. Friday, November 6th, from 8pm-11pm. Visit Norman Brothers Produce for their annual wine tasting and open house. Taste dozens of wines from around the world, and enjoy hors d oeuvres, shrimp cocktail, sushi and desert. Cost is $30 per person in advance,$40. at the door. The proceeds go to UM/NSU Card (Center for Autism and Related Disabilities). Norman Brothers is located at 7621 SW 87th Ave (Galloway Rd). For more information, read the news release or call 305-274-9363. Friday, October 30th and Saturday, October 31st from 11am-4pm. Families and kids 12 and under are invited to join the fun as Metrozoo celebrates Halloween with their annual trick-or-treat event. Participate in costume contests, make Halloween crafts and enjoy special performances. Miami Metrozoo is located at 12400 SW 152 street. For more information please visit www.miamimetrozoo.com..
Saturday, October 31st ,from 5-9pm at Cutler Ridge Park. Experience the terror of the haunted house, the fun of carnival games, and don't miss "Track or Treat" taking place around the new walking path. Cutler Ridge Park is located 10100 SW 200 St. Call 305-284-4166 for more information. Saturday October 31st, 3-5pm. Visit Southland Mall's Fountain Area in front of TJ Maxx for trick or treating for the kids. Then the fun continues from 5 to 7pm where kids under 12 can make creepy crafts, play games, and join in the costume contest at 6:30 pm. Saturday, October 31st, 7am check-in, 5K run/walk begins at 8am. Help in the fight against cancer by sponsoring or participating in this event taking place at the Deering Estate. There will be food and beverages at the end, along with live music and a children's area. For more information or to register for the event, visit reasontorun.org. 18th Annual "In The Park with Art"
Saturday, October 31st and November 1st, from 10am-5pm. Don't miss the Cultural Council's 18th annual "In The Park With Art". See spectacular works of art, enjoy music, and more. Both admission and parking are free. The event takes place at the Palmetto Bay Village Center, located at Old Cutler Road at Southwest 184th Street. For more information visit culture-council.org or call 305-238-0703. Sunday, November 1st, from 9:30-4:30. Visit Fairchild Garden for an opportunity to view birds in their natural habit. Participate in bird walks, lectures, and workshops on how to identify different birds and how to attract them to your yard. Sunday, October 25th, 11am-3pm. Calling all dogs. Girl Scout Troop 319 is presenting a free pet fair featuring music, food (for you and your dog), speakers, adoptable dogs, and much more. You can also get a free portrait with your pet. The fair takes place at 7500 SW 120th St., in Pinecrest. For more information, visit pawarenesspetfair.com. Friday, October 30th from 7pm-11pm. Get a head start on this years Halloween fun. Miami's Metrozoo's Spooky Zoo Night features admission to Dr. Wilde's Screamatorium, spooky tram rides and ghoulish carousel rides. There will be scary movies, chilling story telling around a fire pit and "Thriller" dance lessions. Add to that: roving street theatre, candy stations, and a costume parade all for only $10.95 per person. Get your tickets now by visiting miamimetrozoo.com. Visit the Southland Mall On Sunday, October 24th, from 11am-4pm, and stop by the "Thinking of You Services" table where you can sign Christmas card for our troops overseas. Saturday, October 24th, from 9:30 to 4:30. Visit Fairchild Garden for their Edible Garden Festival featuring food and cooking demonstrations, lectures, demonstrations on creating a fruit and vegetable garden of your own. In addition, they will host their first scarecrow contest. For information on how to enter the contest, or for a $5.00 off coupon visit, fairchildgarden.org. Saturday, October 24th starting at 8am. St. Louis Catholic Church will hold its annual church Bazaar. The church is located at 7270 SW 120 St. Pinecrest. For more information, phone 305-238-7562, ext. 23. On Saturday, October 17th from 9am-5pm. Holy Rosary will be holding their 33rd Annual Fall crafts fair. This family event brings together crafts, jewelry, plants, food, and fun for the whole family. Admission is FREE! For more information, call 305-235-5135. Holy Rosary Catholic Church is located at the corner of Franjo Road and 184th Street. Saturday, October 17th at Bayfront Park. Register for the 14th Annual Komen Miami/Ft. Lauderdale Race for the Cure. You can also make a donation online. For more information, visit komenmiaftl.org. Saturday October 17th, from 12:30 – 2:30pm. Stop by Southland Mall's Center Court for story telling and pick up a book. From 11am-3pm on Saturday, October 10th, at Cutler Ridge Park. Calling all Chili Lovers!!! Chefs compete to make the best chili, salsa, and cornbread in Cutler Bay". There will also be music by local bands and entertainment for the kids. For more information, contact the Cutler Bay Parks and Recreation Department at 305-238-4166. October 10th - October 31st. Prepare to be terrified as visitors to Miami Metrozoo venture into the 7,000 square foot "Scrematorium". Visit with the living dead, walk among graveyards, butcher shops and the deceased. Admission is $5.00 in addition to regular priced Metrozoo admission. For additional information and online ticket, visit miamimetrozoo.com. Wednesday, October 7th, 10 am. Healthy living can begin with this 6 week program for seniors living with long term health issues. Learn how to begin improving your health. To register or for more information phone Eunice Hines at 305-252-4853. Wednesday, October 7th, 6:30 pm. Bring your baby to experience the fun of nighttime stories, songs and finger plays especially for them. Friday, October 9th, 9:30 am. Register now for AARP's Driver Safety Program. This program for both adults and seniors will teach safe driving techniques which may save you money on your insurance. Registration is required to to limited space. Contact T. Laughlin for more information at 305-382-5331. Wednesday, October 28th, 3:30 pm. Children 6-12 can celebrate Halloween with both stories and crafts during the librarys "Pumpkin Time" event. Cutler Bay residents received their notice of proposed property taxes a few weeks ago. The proposed Cutler Bay tax millage rate on this document was 3.031, compared to last years tax rate was 2.447. At the September 23rd budget hearing, the town council voted to adopt a rate of 2.5888. October 3rd from 11am to 4pm. Visit the Gold Coast Railroad Museum where admission is free the first Saturday of the month. Included is free ice cream from noon to 2pm or while supplies last. For more information, visit gcrm.org. Saturday, October 3rd from 7-10pm. The Deering Estate presents "La Dolce Vita" (The Sweet Life) as the theme for their 8th Annual Wine on Harvest Moon. This event will feature authentic italian cuisine, wines of central and northern Italy, and a strolling Trovatori. General admission tickets are $60 for members and $75 for non-members. VIP Tickets are $120 for members and $150 for non-members. To purchase tickets or for additional information, call 305-235-1668 ext 263. Sunday, October 4th, from 9am to 2pm. This event, located in downtown Miami, is fun for the entire family. There will be free bike rentals, free music, free yoga, free children show, free give-aways for the kids and a free party afterwards. For more information visit, http://bikemiamiblog.wordpress.com. Tuesday, October 6th, 7pm. This months meeting will include "Relay for Life" event manager Joanne Parns, Councilman Ernie Sochin, and information provided by Florida Power and Light. The meeting takes place at Cutler Ridge Park, located at 10100 SW 200th St.
Thursday, September 24th, 6:30 pm. (doors open at 6). The community is invited to attend a forum to discuss current events regarding Biscayne Bay including the Turkey Point expansion and seasonal drawdown. Presenters from Tropical Audubon, Clean Water Action and Everglades National Park will discuss their concerns about the environmental and economic impacts these events may have on both the County and Biscayne Bay. The forum takes place at the Pinecrest Library, located at 5835 SW 111th Street. For more information, read the flier. Saturday, September 26th, 9-noon. Join Commissioner Katy Sorenson and the HealthSouth Rehabilitation Hospital for a free community fair. Listen to physician lectures and get free health screenings. There will be music along with activities for the kids including an inflatable slide, arts and crafts, martial arts, games, prizes and much more. For more information, contact Commissioner Sorenson’s district office at 305-378-6677. HealthSouth is located at 20601 Old Cutler Road. Cutler Bay residents received their notice of proposed property taxes a few weeks ago. The proposed Cutler Bay tax millage rate on this document was 3.031, compared to last years tax rate was 2.447. At the September 10th budget hearing, the town council voted to tentatively adopt a rate of 2.5888. The second (final) budget hearing will be held on September 23rd, 7pm, at the South Dade Regional Library. Any questions or comments should be directed to the town council. Is Your Child's Teacher a "Bad Apple"? Want to find out if your child's teacher has been arrested or accused of an ethics violation? Visit this Florida Department of Education website. Ever wonder what happens to your recycling items once they are picked up? Watch this Miami Dade County video. September 19th, 10am-1pm. Learn how to grow low maintenance plants along side your existing landscape. This class takes place at the Redland Fruit and Spice Park, located at 24801 SW 187th Ave. The fee for this class is $25.00. Space is limited. Phone 305-247-5727 to reserve your place in the class and for additional information. September 19th and 20th from 9:30am-4:30pm. The plant show and sale Features a large display of Aroids with on-site experts to help you in your selection. The Aroid family includes Alocasia, Anthurium, Caladium, Philodendron, spathaphyllum and others. Fairchild Garden is located at 10901 Old Cutler Rd. For additional information, and to get a $5.00 off admission coupon, visit fairchildgarden.org. September 20th, from 11am-4pm. This event features European and exotic models, along with music, food and much more. Parking and admission are FREE. For more information, contact Gerry at (786)344-4228. The 2008-2009 budget was approved by the Cutler Bay Town Council at the September 20th, 2008 town council meeting and is available for viewing. Cutler Bay's swim team, the Riptides, has applied for the Nike "Back your Block" grant. They need your vote to help them. Please vote once per day, every day, through September 15th, by visiting. Just enter your email address, vote and then check your email to confirm. On Saturday, September 12th, from 8am-3pm, Holy Rosary Catholic Church will be holding a flea market. This venue provides a great opportunity for residents sell their unneeded items. For booth information, call 305-345-1683. Holy Rosary Church is located at 18455 Franjo Rd. September 12th and 13th. Visit the Center Court for their Health and Family Expo. There will be free health screenings including cholesterol and body fat indexing, product samplings, and education. Cutler Bay's town manager has released a budget memo and budget workbook regarding the upcoming 2009-2010 budget. The information contained in these documents is based on a 3.0310 millage rate (the current millage rate is 2.447). Also available is the town's 2008-2009 third quarter financial report. The band “Transmit Now”, with local resident Tony Aguirre, is being featured this week on the website purevolume.com. To check out their video featuring music from their recently released second EP, visit. August 31st, 6:30-9:30pm, Homestead City Hall Council Chambers, 790 N. Homestead Blvd. September 2nd, 6:30-9:30pm, University of Miami Bank United Center, Hurricane 100 Room 1245 Dauer Dr., Coral Gables. For more information phone 305-375-2835 or visit. Tuesday, September 1st at 7pm. Guest speakers at this months Concerned Citizens meeting include: State Representative Julio Robaina, Cutler Bay Councilmember Peggy Bell, and community activist Ernie Martinez. The meeting takes place at Cutler Ridge Park, located at 10100 SW 200 Street, and is open to all area residents. August 27th, from 6pm-8:30pm. Every seven years the County reviews and updates its Comprehensive Development Master Plan (CDMP). The first step to this process is the Evaluation and Appraisal Report (EAR). The upcoming meeting is your chance to help redirect County growth management policies and offer solutions on development, transportation, along with issues such as sustainability. The meeting will take place at the South Dade Government Center, located at 10710 SW 211 St. For more information, contact Noel Stillings at 305-375-2835 or visit. Saturday, August 29th, beginning at 11:30am. The Cutler Bay Park and Recreation Department will host their First Annual Open Golf Tournament. The event includes a two man scramble golf tournament, range balls, on-course beverages, awards and a sit down dinner with open bar. Cost is $65.00. The tournament takes place at the Keys Gate Golf and Country Club, located at 2300 SE Palms Drive, Homestead. For information on registering for this event, contact the Cutler Bay Parks Department at 305-238-4166. Fairchild Gardens is offering free admissions every Sunday throughout August. Fairchild Gardens is open from 9:30 am to 4:30 pm. For more information, visit. June 1st - August 31st. Every Monday through Friday, Miami-Dade residents can enjoy "buy one get one free" admission with proof of residency. Kids Hope United, a local non-profit organization, is looking for bunk beds for a family with nine children . If you have a bunk bed you would like to donate, please contact Dolly Santana at dsantana@kidshopeunited.org or call 786-573-9000. August 22nd, 1-4pm. The Humane Society of Greater Miami Adopt-A-Pet will be presenting the Summer Lovin' adoption drive at the Cutler Bay PETCO, located at 18579 S. Dixie Hwy. At this free community event, PETCO will be providing give-a-ways, raffles, food, and activities for two-legged and four-legged friends alike. Adoption will cost $50. For more information, contact Laurie at 305-749-1815. On Saturday, August 22nd, from 9am-noon, the Miami-Dade Adopt-A-Tree program will be having a tree give-a-way at the Miami-Dade County Fairgrounds. The Fairground is located at 11200 SW 24th Street. Participants must bring a valid picture ID. For a list of available trees or for more information, call 305-372-6555, 311, or visit the Adopt-A-Tree website. August 22nd, 8pm. Come celebrate the town's new lighted soccer field at Cutler Ridge Park. The park is located at 10100 SW 200 St.
Tuesday August 18th, 6pm. Miami-Dade County will hold a public meeting at the South Dade Regional Library, located at 10750 SW 211 Street, to discuss adjustments to taxes and/or fees. At this meeting, the Office of Strategic Business Management will make a presentation to discuss the county's FY 2009-2010 Proposed Budget. For more information, please call John Sarduy at 305-375-3887. Admission fees will be waived during the weekends of July 18-19, and August 15-16, at Everglades National park, Dry Tortugas, or any other national park. Call Call 305-221-8455 for more information. Purchase a general admission ticket at Miami Metrozoo, Wannado City or the Miami Seaquarium and for an additional $19.95 get unlimited visits to all three through August 30th. Visit summersavingspass.com for more information. Looking for a place to buy local produce. Cutler Bay native, Glen Whitney and his wife Chris have opened a small market in the Redlands selling local produce along with specialty items such as smoothies, milkshakes, key lime pie, banana bread, salsa, and spaghetti sauce. The market is located at 13981 SW 232 Street, and is open year round from Tuesdays through Sunday from 10am-7pm. They can be reached at 786-232-1193. Find out more about them and other interesting places to visit in the Redlands, by visiting www.redlandriot.com. The town's third quarter financialreport is available here. At the July 15th Town council meeting, the council voted to increase the proposed municipal property tax millage rate from the existing rate of 2.447 to a maximum of 3.0310. The proposed rate will serve as the maximum rate the council can adopt at the budget meetings, which are scheduled for September 10th and September 23rd. Adopting the maximum rate would increase municipal property taxes approximately $60 for the average Cutler Bay homeowner. Both Vice Mayor Ed MacDougall and Council member Peggy Bell voted against the proposed increase. Read the town manager's memo stating the explanation for raising the millage rate to offset declining revenues. You can contact the town council with your questions and comments about the proposed tax hike. August 15th and 16th from 10am-5pm. Discover countless ways to turn your household "green". This expo features expert advice, products, and information to help you become more eco-friendly, and includes live demos and workshops, enhibitions, green job opportunities and entertainment. The event takes place at the Doubletree Miami Mart airport Hotel and Exhibition Center, located at 711 NW 72nd Ave. Miami. For more information and a buy-one get-one free admission coupon worth $10, visit www.miamilivinggreen.com or phone 305-412-0000. When shopping for school supplies this summer, please add a few things to your shopping cart to help out a child in need. Kids Hope United, located in Cutler Bay, is looking for donations of backpacks, school supplies or cash donations to help ensure that foster care children are prepared for the upcoming school year. Other requested items include: assignment pads, calculators, compasses, crayons, erasers, folders with pockets, glue sticks or glue, graph paper, ink pens, notebook paper, number 2 pencils, packs of facial tissue, pencil boxes, perforated composition pads, protractors, rulers, safety scissors, spiral notebooks, three-ring binders, and washable markers. Kids United is a registered 501 (C)3, and all cash donations are tax deductible. To make a donation or to get additional information, please contact Dolly Santana at dsantana@kidshopeunited.org or call 786-712-0522. Kids Hope United is located at 10720 Caribbean Blvd, Ste. 500. August 8th from 10am-noon. Using a rain barrel is an great way to catch and use some rainwater. Rain barrel workshops will take place at the Deering estate. Registration is limited. To register call Lize at (305)248-3311 x 242 For additional information visit. August 8th and 9th from noon to 5pm. Get information about after school programs, photography, college planning, insurance and health care during the Falls Shopping Center "Back-To-School" splash. Enjoy free outdoor activities including paddle boats, face painting, bounce houses, live entertainment crafts and more. The Florida Marlins will bring their Street Team and offer music, games, prizes and a fun-along with a surprise visitor. For more information, visit. Looking for a way to keep the kids entertained this summer without spending a fortune. Check out www.miamidade.gov/infocenter/stay_save_2009.asp where you will find coupons, 2 for 1 specials and information about free admissions to local museums and other Dade county attractions. Is Your School "Making The Grade"? The School Accountability Reports are now available. Below are the "grades" for Cutler Bay and surrounding area schools. For additional information, visit. Friday July 31st from 8am-noon and Saturday, August 1st from 8am-2pm. Visit Cutler Ridge United Methodist Church for a huge two day indoor Flea Market. Early morning coffee and a hot lunch will be available. The church is located at 20740 Old Cutler Road (at the corner of Old Cutler Rd. and Marlin Drive). For more information, call 305-235-6651 or 305-235-0561. The following events take place at the South Dade Regional Library, located at 10750 SW 211th St. Call 305-233-8140 for more information. July 22nd, from 3-4pm. Create Your Own Craft. Children make things out of paper, tissue or anything available. July 22nd, 6:30 to 7:30pm. Save the Planet with Earthman. The Earthman Project Concerts use music, the arts and interactive design to teach children and adults that each one of us has the power to make a difference in our home - Planet Earth. To accomplish this mission, the outreach has brought together gifted musicians, visual artists, filmmakers and web designers to reach millions of people with this important message. July 29th, from 3-4pm. A Game Is a Game Is a Game! Enjoy playing table or other group games. July 25th and August 29th at 8pm. The Deering Estate hosts the 6th Annual Summer Cabaret Series. Guests can bring refreshments and snacks to enjoy during the show. Single tickets are $20, or $55 for the three-concert series. To purchase tickets or for more information, call 305-235-1668 ext. 233, or visit deeringestate.org. The Deering Estate is located at 16701 SW 72 Avenue. July 25th - 26th from 9:30am to 4:30pm. Learn to idenify South Florida's butterfly species and the plants that attract them. Admission is $20 for adults, $15 for seniors and $10 for children 6-17. Miami-Dade Transit recently opened a new 456-space Park & Ride lot at SW 204th St and SW 112th Ave., in Cutler Bay. This new lot, located next to Target, will replace the 95 space lot located at 200th St. Read the news release for more information. Saturday, July 11th and Sunday July 12th, from 9:30am-4:30pm. Fairchild Gardens presents their 17th International Mango Festival featuring tree sales, lectures, children's activities, food demonstrations, an international fruit market and more. For more information, phone 305-667-1651 or visit www.fairchildgarden.org. Admission is $20 for adults, $15 for seniors, and $10 for children. Miami-Dade Transit is opening a new 456-space Park & Ride lot at SW 204th St and SW 112th Ave., in Cutler Bay. This new lot, located next to Target, will replace the 95 space lot located at 200th St. The public is invited to attend the official ribbon cutting on Friday, July 10th at 10am. Read the news release for more information. Miami-Dade county is offering to send out an email reminder the evening before your recycling day. If you wish to participate in this service, visit. Effective Sunday, June 14th, more than 60 bus routes will be adjusted. See which routes will be affected at miamidade.gov/transit/alignment-09.asp. Kids Hope United is looking for a vacuum cleaner for one of their foster homes. If you have a working vacuum you would be willing to donate to a needy family, please contact Dolly Santana at dsantana@kidshopeunited.org. Plantation-based call-center operator PRC said it plans to hire 250 people at its Cutler Bay site, located at at 19500 S. Dixie Hwy. Information on the job openings is available at PRCcareers.com or by calling 786-293-4444. The Whispering Pines Civic Association and the Whispering Pines Woman's Club will sponsor their 42nd annual Fourth of July Celebration at the Whispering Pines Park, located at SW 88th Court and Ridgeland Drive (map). A parade featuring decorated floats and bicycles begins at 9:00 A.M. Participants must report to the Elementary School parking lot, 18929 S.W. 89 Road by 8:15 A.M. Along with music provided by Mike Schuler, there will be a bounce house, water slide and Humble Hearts Puppet Show for children, hamburgers, hot dogs, snowcones, popcorn, cold drinks, prizes, U.S. Air Force flyover (weather permitting), and free watermelon after the parade. This event is free and open to all residents of Cutler Bay and South Dade County. For more information, call 305-235-6709 or 305-235-0561 or read the flyer. There will be a July 4th fireworks display at Black Point Marina beginning at 9pm. The fireworks display is presented though the efforts of Commissioner Katy Sorenson, several municipalities, and local businesses. See the flyer for more information. Palmetto Bay residents also voted in favor of these 2 amendments. In addition, they voted to eliminate their mitigation payments to the county by a vote of 93.71% in favor. In addition, 68.17% voted to make it more difficult for private schools to expand. Over 4600 Palmetto Bay residents participated in the election. To see all the election results, visit. Saturday, June 27th, beginning at 7pm. Holy Rosary Catholic Church invites you to share an evening as they journey through time performing some of the country's most patriotic songs. Bring a blanket and chairs. Admission is free. Hamburgers will be available for $3, hot dogs for $2, and drinks for $1. For more information, call 305-235-5135. The Town Charter currently provides for qualification periods for candidates for Town elections that may only be altered by amending the Charter. It is proposed that the Charter be amended to allow the Town to alter those qualifying periods by ordinance if necessary to comply with changes to state or federal law or to the policies of the Miami-Dade County Supervisor of Elections office. Shall the above-described Charter Amendment be adopted? The Town Charter currently provides that the Town is required to contract with and pay for specialized police services from Miami-Dade County. It is proposed that the Charter be amended to eliminate the requirement to pay additional fees for the services and to eliminate the "favored nation" status for specialized police services. Shall the above-described Charter Amendment be adopted. June 24 from 3-4 pm. Something to Sing About. Children can participate in a singing talent show where everyones a winner. June 25 from 3-4 pm. Jazz It Up. Children ages 6 and up can listen to jazzy stories and music then have fun playing their own instruments. Friday, June 19th from 10am-2pm. Visit the Center Court at Southland Mall for a Career Resources Expo sponsored by Commissioners Katy Sorenson and Dennis Moss and the Town of Cutler Bay. Over 80 participants will be present: companies/organizations that are hiring, educational/training institutions, resources for families with children, agencies that provide services to United States veterans, etc. For more information, read the poster or contact Chris Himmel at 305-971-5080 or via e-mail at chrish@miamidade.gov. June 20th and 21st from 10 am - 5 pm. Visit the Redland Fruit and Spice Park for this annual event showcasing local agriculture, tropical fruits, local wines, foods and rare fruit samplings. Redland Fruit and Spice Park is located at 24801 SW 187 Ave. Admission is $6 for adults, and free for children under 11. Phone 305-247-5727 for additional information. June 13th and 14th, from 9:30-4:30pm at Fairchild Tropical Botanical Gardens. Visit Fairchild to buy and learn more about bamboo, an ecologically beneficial plant that grows quickly and has a high carbon dioxide absorption rate. Fairchild Garden is located at 10901 Old Cutler Road. Phone 305-667-1651 for additional information or visit fairchildgarden.org for more information and for a $5.00 off admission coupon. June 13th, and 14th, from 10am-5pm. Your cat can be a star at Cauley Squares first annual Pet Fest. Join the fun as your pet participates in the Pet Parade on Saturday and Pet Pageant on Sunday. This event is to raise money for the Cat Network, an organization that provides medical services and finds homes for abused or abandoned cats. For more information contact Island Colors at 305-258-2565. Cauley Square is located at 22400 Old Dixie Hwy. Sunday, June 14th from 8-11am. Experience the beauty of Biscayne Bay as you make your way from the Deering Estate to Chicken Key by canoe. Cost is $25 for Adults, $15 for children ages 9-14. Call 305-235-1668 for more information. June 8th through the 12th. The Cutler Ridge Soccer Club will begin competitive tryouts starting on June 8th. To find out more about the club and for the tryout schedule, visit. Also on the website, check out the pictures of the new lighted soccer field and walking path being built due to a cooperative agreement between the school board and the Town of Cutler Bay. For more information, write to info@cutlerridgesoccer.net. According to the South Florida Business Journal, Bank of America has filed foreclosure documents against the owner of the proposed Vista Del Lago shopping center, The shopping center, at SW 216th Street and SW 92nd Ave. was slated to include a new Publix supermarket. According to the owner, he was unable to acquire construction financing. For more information read the article. Saturday, June 6th from 7am-3pm. Join professional, amateur and junior fishing enthusiasts as they compete for $30,000 in cash and prizes. The weekend event begins on Thursday, June 4th at 7pm with a Captains Party; the fishing event takes place on Saturday with the festivities concluding on Sunday, June 7th at 6pm with an awards ceremony and dinner. For more information, visit. Saturday, June 6th and Sunday, June 7th from 9:30 am to 4:30 pm. This show takes place at Fairchild Tropical Gardens, located at 10901 Old Cutler Road. Phone 305-667-1651 for additional information or visit fairchildgarden.org for more information and for a $5.00 off admission coupon. On Saturday, June 6th, from 9am-noon, the Miami-Dade Adopt-A-Tree program will be having their last tree give-a-way for the year at the Harris Field Barn Pavilion. Harris Field is located at 1034 NE 8 Street, in Homestead. Trees for this event include Inkwood, Jamaica Dogwood, Desert Senna, Carambola, Lychee and Tamarind. Participants must bring a valid picture ID. For more information or for other Adopt-A-Tree dates and locations, call 305-372-6555, 311, or visit the Adopt-A-Tree website. June 1st, begining at 7pm. Equipment will be provided. You can bring your own paddle. Rules will be posted. Sign up at Cutler Ridge Park by May 29th. For more information, call 305-238-4166. During the month of May, your new or existing membership to participating museums will allow you to "museum hop" at no additional charge for the month of May. To see which museums are participating in this program, visit. The "Spring into Reading" book drive is collecting books until May 28th, 2009 to benefit various children's organizations throughout Miami-Dade County. Drop off your new or slightly used books at any Miami-Dade Fire Rescue Station, Miami-Dade Police Department or at City National Bank (11675 South Dixie Hwy). In the last few weeks, appoximately 20-24 cats have been found mutilated and killed in Whispering Pines and Palmetto Bay. If you have any information relating to this horrendous crime, please contact Crime Stoppers at 305-471-TIPS (8477). Keep your cats inside or somewhere safe at night until this individual(s) is found. For more information, read the CBS4 news story. Thursday, May 21st at 7pm. Enjoy a performance by the Miami String Project, an orchestra comprised of talented youth throughout the county. They will be performing a variety of music that spans four centuries. The event takes place at the Deering Estate. Admission is $15.00. Friday, May 22nd, through Sunday, May 24th, 2008, from 9:30 am to 4:30 pm. This show and sale features drought tolerant plants. A perfect choice to help conserve water. Presented by the South Florida Cactus & Succulent Society. The show takes place at Fairchild Tropical Gardens, located at 10901 Old Cutler Road. Phone 305-667-1651 for additional information or visit fairchildgarden.org for more information and for a $5.00 off admission coupon. The demolition of 110 residential units, as well as administrative and common areas. Construction of a 2 and 3 story building containing 125 independent living units, 60 assisted living units, 82 memory care and skilled nursing suites, as well as administrative and common areas. East Ridge Retirement Village is seeking site plan variances for building heights, lot coverage, and signage. The first session of the workshop will provide a forum for members of the public to learn about the proposed development. The public is encouraged to ask questions and to provide feedback to the applicants about the proposed development. For more information, read the public notice. The Cutler Bay town council has passed ordinances which impose a moratorium on the issuance of site plans. Site plans can be exempt from the moratorium if a development commits to obtaining a "green" building certification. Job Search Assistance. Wednesday May 13th, starting at 2pm. Learn how to use the Internet to search for job opportunities. AARP Driver Safety Program. Thursday, May 14th. Lean safe driving techniques and save money on your insurance. Registration is required, and space is limited. Contact T. Laughlin for information and registration. 305-382-5331. Storyweaver. Thursday, May 14th starting at 4 pm. Families can join Diane Williams as she shares stories from books, history, myths, legends and folktales. Immigration and Bankruptcy Seminars. Wednesday, May 20th starting at 7:30. Get answers to your immigration and bankruptcy questions. May 15th, 16th and 17th from 9am -5pm. Visit the largest annual orchid show in the US with over 50 booths and vendors. Various types of orchids, plants, and supplies are for sale, as well as lectures by experts, raffles, and international food. The event takes place at the Redlands Fruit and Spice Park. Admission is $5.00. For additional information, visit. On Sunday, May 17th, from 2-4pm (arrive by 1:30). Take a cruise on the "Pelican Island Skipper", a 45-foot catamaran, as you explore the waters of Biscayne Bay. Learn about birds, sea mammals, Native Americans and early pioneers. The cruise is open to all ages at a cost of $35.00 per person. To reserve your space, call 305-235-1668 ext. 233. For more information, visit deeringestate.org. Mothers Day Brunch at The Deering Estate. Sunday, May 10th, from 10:30 to 1:30. Treat mom to a Mother's Day celebration at the Deering Estate. The Brunch is $70 for adults and $45 for children 5-12. Advanced registration is required. Call 305-235-1668 ext.233 for more information and for reservations. May 10th. Give Mom a break from her usual zoo. Including a tram tour and brunch. Check-in begins at 9:30 am with tram tours from 10-11. Afterwards, enjoy a delicious brunch from 11am-12:30pm. The cost for non-members is $39.95 for adults and $36.95 for ages 3-12. Cost includes zoo admission, tram tour, monorail pass and buffet. For more information, visit miamimetrozoo.com. On Sunday, May 3rd, a female, chocolate Labrador Retriever with a blue collar but no identification was found running north on Old Cutler Rd. and SW 188th Street. If you are the owner of this dog or have any information about this dog, please send us an email. Friday, May 8th, beginning at 6:30pm. Visit the Palmetto Bay Village Center for their 7th Annual Wine Tasting event. This event, which benefits both Kristi House (www.kristihouse.org) and the South Florida Boys Choir, includes wine, appetizers, deserts, and a silent auction. Tickets are $25.00. For more information, read the flyer. To purchase tickets, contact Ronnie Heller at 305-666-2511, ext.314 or email rheller@youngstovall.com. The Palmetto Bay council has approved plans allowing the county to build a 3-bay Fire-Rescue station on the Palmetto Bay Village Center grounds, next to the new library. This new station, which will be built to LEED standards, will serve both Palmetto Bay and Cutler Bay. Agreements were made to preserve the rock pinelands, hammocks, and mangroves on the property. Saturday, April 25th from 8:00 am to noon. Volunteers will be removing exotic plants at Saga Bay Park and joining the town as they plant a new tree in celebration of Arbor day. Afterwards all volunteers and their families will be rewarded for their work with a lunch at Cutler Ridge Park, with free food and music. At least one family member must volunteer for the clean-up in order to attend the lunch. Saga Bay Park is located at 7900 SW 205th St. (map). On Saturday, April 25th from 9:30am until 4:30pm (members may enter at 9am). Visit Fairchild Tropical Botanic Garden for their Spring Plant Sale. These native plants are perfect for South Florida landscapes, requiring little care, water or fertilizer. Be sure and arrive early for the best selection. In addition, enjoy food and music of the Caribbean. The Fairchild Garden is located at 10901 Old Cutler Road. For additional information and to print a $5.00 off admission coupon, visit. Saturday, April 25th, from 10 am to 7 pm. Visit Miami's Bayfront Park for an eco-friendly event showcasing green energy, transportation, building and travel. Learn about recycling, conservation and green products for your home. Enjoy live entertainment and hands-on activities along with a family fun zone and an experiment tent. For more information visit, miamigoingreen.com or phone the events hotline at 305-461-2700. April 25th and 26th from 11am-4pm. Visit Metrozoo for free if you turn in an old cellphone as part of their ECO-CELL phone recycling program. Your cell phone will help raise money to save gorillas. One admission per cell phone donation. While you are there, enjoy the “world's largest” flowering tree show and sale. For more information visit metrozoo.com. For more information, phone 305-251-0400. Sunday, April 26th from 10am-5pm. Visit the Deering Estate for a series of youth performances, an art exhibition, along with a 5K Dash that will kick off the day's events. Along with the youth artwork and performances, their will be a Kid's Zone with face painting, exo-art projects and more. The event is $10 for adults and free for children and youth grades K-12. Call 305-235-1668 ext. 233 for additional information. Enrollment period, March 30th through April 24th. Are you unhappy with your child's school? Does your child need a tutor? You may be able to transfer your child to another district school and receive transportation, or receive free tutoring, under the No Child Left Behind Act. For more information, visit or call 305-995- 7291. Thursday, April 23, 5:30 pm. Back in February two local residents produced a video of a mock funeral to protest school funding cuts. Join them, along with local community leaders and concerned residents, to protest cuts in education funding by holding another mock funeral. Participants are asked to wear all black and bring items that represent an area of your child's education. The rally will take place by the flag pole at Palmetto Bay Park, located at 17535 SW 95th Ave.(map). Read the flier and visit betterfunding.org for additional information. Upcoming meeting of the Nuclear Regulatory Commission to discuss FP&L's application for 2 new nuclear reactors. For more information, read the NRC news release and meeting details and agenda. Friday April 24th, 10am-3pm. Miami-Dade County Agricultural Manager Charles LaPradd will host a Farmers' Market at the South Dade Government Center Lobby, 10710 SW 211 St. A great way to experience locally grown products is to visit a fresh farmers’ market. The South Dade Government Center’s Farmers' Market will have local growers on hand with honey, plants, fruits and vegetables. Kids Hope United is looking for a crib for a 7 month old. If you can donate a crib or know someone who might, please contact Dolly Santana at dsantana@kidshopeunited.org. Kids Hope United, located in Cutler Bay, is dedicated to helping children who have been the victims of abuse and/or neglect. Wednesday, April 22nd, from 9:30am to 4:30pm. Fairchild Garden will celebrate Earth Day by giving free admission to all visitors. The shop will have a special eco-display and an extra 10% off shop merchandise. Wednesday, April 22nd, from 6:30pm to 9:00pm. Commissioner Katy Sorenson has scheduled a workshop for business owners to discuss assistance and resources available as a result of the Recovery Act. Six organizations will be on hand to make presentations followed by one-on-one consultations. The workshop takes place at the Dave and Mary Alper Jewish Community Center (JCC), located at 11155 SW 112 Ave. For additional information, contact the Commissioner's district office at 305-378-6677. On Saturday, April 18th, join the American Lung Association and Miami Metrozoo for their 4th annual 5K walk. To register or get more information, visit greatermiamicontinentals.com, or call 305-233-4594. Miami Metrozoo is located at 12400 SW 152nd Street. Sunday, April 19th, from 10am until sundown. Visit the Crandon Visitors and Nature Center for an Earth Day celebration. From 10-2, attend one of the many workshops taking place including how to construct a rain barrel, create an organic garden, or learn how to run your home more efficiently. Then enjoy musical performances from 2 to 8pm. There will be tram tours, nature walks, children's activities and a host of green venders and delicious foods to enjoy. Bring a blanket or chair, your own water bottle (free refills), drum or instrument for drum circle, and any electronic or computer equipment to recycle. Call 305 361-6767 ext.3 or visit for more information. Admission is free but parking is $5.00 per car. On Saturday, April 18th from 10am-2pm, at the South Dade Regional Library, 2nd floor. This is your opportunity to provide input on the future planning of the US-1 corridor. Do you envision high density mixed use buildings or 2 story businesses? Will future buildings be required to be built close to the street with parking in the rear? Come share your vision of the future of our most traveled road or be content to live with someone elses choice. Get back into cycling. Cutler Bay now has two bike clubs to accommodate cyclists of all levels. The first is for beginners wanting to meet other local cyclists while enjoying a leisurely ride. For information visit bike.meetup.com/417. For more advanced riders, visit bike.meetup.com/338. Both groups meet on Saturdays at 7:30am and on Tuesdays and Thursdays at 6pm, at various locations. There is a small $10.00 yearly membership fee payable after your 3rd ride. For additional information on either of these bike clubs, contact Manny at 305-283-3413. April 10-12th from 10am-4pm. The Miami Seaquarium invites you to join them for their annual Easter Egg Hunt. There will be three days of continuous easter egg hunts, lots of prizes, and a "Bunny Zone" with a variety of interactive activities for the kids, and the Easter Bunny's special arrival ceremony at 11 am daily. Visit Bunnypalooza where kids will enjoy inflatable rides, a giant fun slide, bounce houses, mechanical rides, music, face painting and more. For additional information, visit miamiseaquarium.com. Saturday April 11th and Sunday, April 12th from 11am-4pm. Join the fun at Metrozoo during their Great Egg Safari. There will be continuous egg hunts for kids 12 and under, music, and photos with the Easter Bunny. The cost of admission is $15.95 for adults and $11.95 for children. For more information, visit. Sunday, April 12th, from 10am - 4pm. Visit Cauley Square for pony rides, face painting, and arts & craft classes. The egg hunts begin at 1 pm for children ages 1-5 and at 3 pm for children ages 6 -12. Entrance and parking are free; there is a $5.00 charge per child for the egg hunts. Cauley Square is located at 22400 S. Dixie Hwy. visit cauleysquare.com for details. March 26th-April 12th. The Fair brings 18 days of fun-filled family entertainment, including rides, entertainment, food, exhibits, a daily Mardi Gras parade with a different celebrity, Grand Marshal each night, floats, samba dancers and drums. General Admission is $9. Visit fairexpo.com or call 305-223-7060 for more information. The fair grounds are located at Coral Way and 112th Avenue. Saturday, April 11th, at 10am. The Town of Cutler Bay invites children ages 9 and under to participate in a Easter Egg Hunt at Cutler Ridge Park, located at 10100 SW 200 Street (Cutler Ridge Dr.). There will be games before and after the egg hunt. The first 100 children will receive a 4x6 framed picture with the Easter Bunny. Parents are also welcome to take pictures of their child with the Easter Bunny. For more information, call 305-238-4166. April 6th-10th, from 9am-4pm. Children, ages 6-13, will learn about history, archeology, and nature by taking part in a series of hands on activities at the Deering Estate at Cutler’s Spring Break Camp. Camp activities include: nature hikes, educational environmental projects, arts & crafts, a canoe trip (ages 9-13) and participation in an exciting archeological dig. The cost is $188 per child plus a $10 yearly registration fee. For more information, visit. April 4th from 10am - noon. Learn how to make your environment safer and healthier by replacing toxic chemicals from your home and workplace. This class takes place at the Redland Fruit and Spice Park, located at 24801 SW 187th Ave., in Homestead. To register, phone 305-247-5727. Removing the requirement that the town contract police services through Miami-Dade County. A change to allow the town to modify the qualifying period for an election. The meeting will take place at Town Hall, located at 10720 Caribbean Blvd., Suite 105. For additional information, Read the agenda. March 28th and 29th, from 9:30am -4:30pm. Visit Fairchild Garden for their annual celebration of fresh foods and beautiful gardens. Buy locally grown produce and watch cooking demonstrations. On Sunday, kids will enjoy special hands-on activities. Fairchild Gardens is located at 10901 Old Cutler Road. Sunday, March 29th from 11am to 6pm. Savor delectable seafood and enjoy the music at the Deering Estate's 5th Annual Deering Seafood Festival on the Bay. This event features food, music, art exhibits, scenic boat rides, cooking demonstrations, and a kids zone. Cost is $15.00 for adults; $5.00 for Children ages 4-12. For more information, call 305-235-1668 ext. 263, or visit. On Saturday, March 28th from 8:30pm to 9:30pm, join millions of people across the world as they turn off their lights for one hour to raise awareness about climate change. For more information, visit earthhour.org. Friday, March 27th from 9am until noon. Join your neighbors in helping to restore the Ned Glenn Preserve. Volunteers will be removing exotic vegetation and cleaning up debris while learning how to identify invasive plants. This beautiful preserve is located in Whispering Pines at SW 188 St and 87 Ave., adjacent to Whispering Pines park. For more information, call Yolanda Gonzalez at 305-372-6687. Thursday, March 26th, 6:30 pm at the South Dade Government Center. In response to a recent Miami Herald article regarding the safety and performance of the Turkey Point nuclear reactor and receiving calls from residents, Commissioner Katy Sorenson is organizing a public meeting so that residents can publicly discuss these concerns and FPL officials can address them. For more information, read the news release. Please make plans to attend this very important meeting. A couple of years ago, area residents sent emails to the county opposing the filling of wetlands and development at 184th and Old Cutler Rd. Now, the South Florida Water Management District is considering a project that cuts off 30 acres of wetlands from Biscayne Bay. This action, along with an Environmental Resource Permit (ERP), may allow for the filling of these wetlands. Tropical Audubon is hosting a meeting to discuss Biscayne Bay issues such as Cutler Properties, Biscayne Bay Coastal Wetlands and current legislation to eliminate environmental regulation in the name of "economic stimulus". Come learn how these issues impact us locally and voice your opinion. The meeting will be held this Wednesday, March 25th, 7:30pm at the Doc Thomas House, 5530 Sunset Dr. (map). If you have any questions, call 305-667-7337 or email Laura Reynolds at tropicalaudubon@gmail.com. For more information and updates on the Cutler Properties parcel at 184th St and Old Cutler Rd., visit. March 21st beginning at 6 pm until noon on March 22nd. Join the residents of Cutler Bay and Palmetto Bay as they join to raise money for cancer research. The relay will take place at Miami Childrens Hospital, South Dade Center, located at 17615 SW 97th Ave (near the intersection of US-1 and Franjo Rd). For more information visit. If you can't make it to the event but wish to make an online donation to the Whispering Pines Willing Walkers, visit. March 21st, from 10am-2pm. You can surrender your exotic pets, free of charge with no questions asked during Metrozoo's Non-Native Amnesty Day. For more information, visit. Free Neutering for Cats- MEOW!!! March 22nd, at 9:30 am. Miami-Dade County residents can get their male cats neutered for free. You must make an appointment. Proof of current rabies vaccinations is required for cats over 4 months of age, but the vaccine can be obtained the day of the surgery at no additional cost. For additional information, visit. Animal Services is located at 10700 SW 211th St., behind the South Dade Government Center. March 21-22nd, from 10am-5pm. Find great ideas for transforming your backyard into a tropical paradise. This event features exhibits, workshops and lectures, music, food, arts and crafts activities for the children, and 50 venders. Pinecrest Gardens is located at 11000 Red Road. Cost is $5.00, kids 12 and under free. For more information, call 305-284-0900 or visit pinecrestgardens.com. On Friday, March 13th - Sunday, March 15th, from 9:30am - 4:30pm. This event features more than 10,00 orchid from 50 vendors, walking tours, workshops, great food and entertainment. Experience the sculpture garden featuring the artwork of Fernando Botero, Dale Chihuly, Kris Martin, Mark di Suvero and Daisy Youngblood. For more information please contact Ann Schmidt at 305-667-1651, ext. 3344 or by email. Fairchild Gardens is located at 10901 Old Cutler Road. On Saturday, March 14th, from noon until sunset. Spend the day enjoying a taste of Irish culture. Enjoy Irish music, Irish crafts and of course great Irish food. Lot's of fun for the kids including clowns, face painting, a giant slide, rock climbing and more. For additional information, visit. From January through May, Fairchild Gardens will be open on Thursday nights from 6-9pm where patrons can enjoy a host of different events from concerts, walking tours, performances, movies and more. Admission is $15 for non-members, and $8 for their children ages 6-17. For members the admission is $10 for adults and $5 for their children (children 5 and under are free). For information about what events are taking place each Thursday, and to purchase tickets online, visit their website at fairchildgarden.org. AARP Tax Preparation Assistance. Various Dates. South Dade Regional Library will have IRS certified AARP Tax-Aide volunteers to assist you in preparing your federal income tax forms. For specific dates and times, call the library at 305-233-8140. Go Fly a Kite. March 17th, from 3:30-4:30pm. Learn how to make a kite at the South Dade Regional Library. For Ages 6-12. From March 1-15th, Miami-Dade Fire Rescue will be accepting online applications for the position of firefighter. Anyone who has previously applied must re-apply to become eligibile for the new hiring list. For more information, visit. This Sunday, March 8th, turn your clock ahead 1 hour for the start on Daylight Saving Time. To learn more about DST, visit. Because of the many products currently subject to recall due to the possibility of a salmonella contamination at PCA's plant in Georgia, the FDA has created a searchable product database. The Cutler Bay Town Council is holding a special meeting to discuss transportation projects that will allow the town to receive federal stimulus money. The meeting will be held on Tuesday, March 3rd, 6pm, at Cutler Bay Town Hall. Town Hall is located at 10720 Caribbean Blvd., Suite 105. Read the agenda and supporting documentation for the meeting. Kids Hope United would like to celebrate Easter by hosting the 4th Annual Easter Eggstravaganza for the children in their care on Saturday, March 21st, 2009. Activities will include an egg hunt, music, bounce houses, games, food and a visit from the Easter bunny! You can help by providing funding for catering, sponsoring child minded entertainment, or making a cash donation. To submit your donation or obtain more information, please contact Dolly Santana, Fund Development Coordinator, at 786-712-0522 or email. Kids Hope United is looking for orthodontists who are interested in doing pro-bono work for children in foster care. If you are, or know of anyone who might be willing to help these children, please contact Dolly Santana at 786-712-0522 or email. The Town of Cutler Bay adopted an ordinance that allows low-income senior citizens over the age of 65 an additional $25,000 property tax exemption. All applications must be filed by March 1st. For more information, visit. March 1st at Cauley Square from 11am-4pm. Featuring European and exotic models. This fun family event includes music, food and much more. Parking and admission are FREE. For more information, contact Gerry at (786)344-4228. The Town of Cutler Bay has received a grant of $50,000 to help fortify the building at Cutler Ridge Park so it can be used as an emergency operations center. The cost of the entire project will be $140,000. These upgrades will also help protect our children who play and attend after school activities at the park in the event of an unexpected weather event. On Saturday, February 21st from 11am-3pm at Cutler Ridge Park. Join your friends and neighbors to celebrate Cutler Bay's 3nd anniversary. Enjoy: free food including chicken and ribs, entertainment, rides, games, and more. Come prepared to participate in the Cutler Bay food fight and bid to throw a pie in the face of your "favorite" council member. Cutler Ridge Park is located at 10100 SW 200th St. For more information, call 305-238-4166. (map). February 22nd, registration and Resource Fair opening at 8:30am, Opening ceremonies begin at 9:30 with the walk beginning at 10am. Autism affects 1 in 150 children. The Miami-Dade Walk Now For Autism will be held on February 22nd at Crandon Park on Key Biscayne. The walk raises funds for autism research and also serves to raise autism awareness. There will be childrens activities, light refreshments available and entertainment. To donate, volunteer, or for more information, go to walknowforautism.org/miami. On Saturday,February 21st, from 8am-3pm, Holy Rosary Catholic Church will be holding a flea market. For booth information, call 305-345-1683. Holy Rosary Church is located at 18455 Franjo Rd. Welcome to Cutler Bay's newest restaurant. Along with wings and 14 signature sauces, the restaurant offers burgers, ribs, sandwiches, wraps and more. With 8 big screen TV's and numerous smaller sets it's the ideal location for family dining or to watch your favorite sporting event. The restaurant is located at Southland Mall next to Bally's Fitness. They are open Sunday-Wednesday from 11am-midnight and on Thursdays-Saturdays from 11am until 2am. For more information, read the press release or visit their website at http://buffalowildwings.com. On February 14th, 15th and 16th from 9am-6pm. Enjoy one of the nation's premier outdoor Fine Arts Festival. Visitors enjoy beautiful art work, fine cuisine and live entertainment. Kids can create their own works of art at the kids creative corner. The fair takes place in Coconut Grove along the streets of McFarlane Road, South Bayshore Dr. and Pan American Drive. Round-trip shuttle service runs every 15 minutes from the Douglas Road Metrorail station. For more information, visit coconutgroveartsfest.com. Admission is $7 per person per day. Children 12 and under, Metrorail Golden Passport and Patriot Passport holders are free. Stephanie Keime and Lisa Richardson, two mothers from Cutler Bay, have started a campaign to fight school funding cuts and ensure better educational funding for Florida schools. Visit their website and watch the video to find out how you can help their grass roots effort to protect our childrens education. Visit http://betterfunding.org. On Saturday, February 14th, visit the Deering Estate for a romantic concert under the stars on the edge of Biscayne Bay. The concert features Jazz vocalist Nicole Henry with an opening performance by local country artist Erin Pettit. The gate opens at 7pm and the concert begins at 8pm. Cost is $20. Guests can bring blankets, lawn chairs, & picnic baskets. Limited refreshments will be available for an additional fee. For more information, call 305-235-1668 ext. 233. or visit. Saturday, February 14th, at 7pm. Visit Fairchild Gardens for a magical night of romantic classics performed by legendary jazz musician Arturo Sandoval and vocalist Wendy Pedersen. Bring blankets and a picnic basket and enjoy this beautiful music under the stars. Admission to the performance is $55.00 pp for members, $70.00 pp for non members. VIP reserved seating and candlelit buffet dinner is available at a cost of $150.00. Gates open at 5:30pm. For additional information, call 305-667-1651 ext. 3391. There will be a Land Development Regulations (LDR) zoning workshop on Wednesday, February 11th, 7pm, at Cutler Ridge Park, located at 10100 SW 200th St. Read the agenda for the meetings. Wednesdays, February 11th, March 11th and April 8th from 6-8pm. Wander through Vizcaya�s breathtaking gardens along Biscayne Bay under the light of the full moon. Enjoy informal concerts of live music and light refreshments for sale in the Courtyard of the Main House. Tours are available beginning at 6:30 pm. Admission is $15 per person; $10 for students, seniors, and Vizcayan members. Miami-Dade County recently completed a traffic study for the intersection of Caribbean Blvd and 192nd Drive (map). This study recommended that a traffic circle be placed at the intersection to hopefully prevent the numerous accidents that have taken place there. Miami-Dade Water and Sewer Department and FP&L are negotiating on the financial aspects for the county to provide reclaimed water from it's South District Waste Water Treatment Plant to the Turkey Point nuclear power plant via a nine mile pipeline. The addition of two new nuclear units that will begin operation in 2018 and 2020 will create a demand for an additional 84 million gallons of water per day at the facility. The South District Plant is located at 8950 SW 232nd Street, just outside the border of Cutler Bay. For additional information, visit. Reversing a no-development policy set last year, leaders of the South Florida Water Management District said last week they would give case-by-case consideration to applications to build on coastal wetlands set aside for restoration in South Dade. The decision might directly affect Cutler Properties, which applied three years ago to build on its 136 acres at the southeast corner of Southwest 184th Street and Old Cutler Road in Cutler Bay... Read the complete Miami Herald article here. Miami Herald Neighbors reporter Patricia Mazzei will no longer be covering local events in our community. She has been transferred to a new position with the Herald covering the Broward County School system. We wish Pati continued success in her new position. She can be reached at pmazzei@MiamiHerald.com. Replacing her will be reporter Howard Cohen. Congratulations to County Commissioner Katy Sorenson who was named as the new chairman of the budget, planning and sustainability committee. On February 5th, 6th, 7th and 8th, join the fun as Our Lady of the Holy Rosary Catholic Church presents their annual Carnival. Enjoy midway rides, international foods, music and a variety of other entertainment. Discount tickets will be sold in advance at the church and school offices until February 4th. Holy Rosary Church is located at 9500 SW 184 St (corner of Franjo Rd and Eureka Dr). On Sunday, February 8th from 11am-6pm, visit Miami Dade College's Kendall Campus for their yearly festival celebrating the start of the Chinese New year. Enjoy acrobats, cultural shows and music, arts and crafts, a children's playground with rock climbing, bounce house and chute slide along with exotic Asian food. Admission is $10.00 for adults, $5.00 for children under 12. For more information, phone 305-333-1066. The College is located at 11011 SW 104th St.
On Friday, February 6th at 7pm, visit the historic Stone House Ballroon at the Deering Estate for its Living Artists Concert Series: "Emerging", featuring pianists from FIU's piano department. General admission is $35.00. For more information, call 305-235-1668 ext. 233. Saturday, February 7th beginning at 8am. Visit our neighbor to the south and participate in their Hearts & Soles 5K walk/run. The event takes place at Losner Park in Homestead (map). For additional information phone 305-224-5586. For additional information visit, www.runmiami.com. February 7th, from 10am-1pm. Visit the Redland Fruit and Spice Park and join park manager Chris Rollins as you visit various orchards and vegetable farms throughout the Redlands. The Fruit and Spice Park is located at 24801 SW 187 Ave. The cost is $25 per person. For more information, visit or phone 305-247-5727. Wednesday, February 4th at 7pm. Visit the Deering Estate and enjoy an evening of poetry and music presented by the South Florida Writer's Association. The event takes place in the historic Stone House Ballroon. Admission is $10 for adults, $5 for children 4-14, and free for foundation members. For more information, phone 305-235-1668 ext. 233. Sunday, February 1st from 12:30-3:30pm. Both children and adults are invited to attend a Poker & Mahjong tournament at Temple Bet Shira. The temple is located at 7500 SW 120 St. in Pinecrest. All proceeds from the poker chip sales will go be donated to the Community Committee for Developmental Handicaps to repair children's wheelchairs. For more information, call 305-484-2290. On January 31st, from 9am-noon. Help assist with a coastal clean up while obtaining community service hours. The Deering Estate is located at 16701 SW 72nd Ave, in Palmetto Bay. Call 305-235-1668 for additional information. Saturday, January 31st from 1-4pm. Visit Baptist Hospital for their 18th Annual Health Day for Women. This free event includes health screenings, demonstrations, chair massages and lectures by experts. Baptist Hospital is located at 8900 N. Kendall Dr. For more information, call 786-596-5981 or visit www.baptisthealth.net. 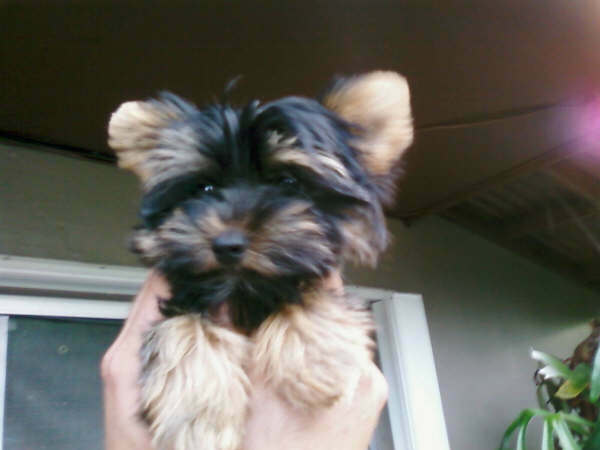 "Yoshi" a 10 month old, 4 lb toy Yorkie went missing on Saturday, January 17th from his home at 198th Terrace and 89th Ave. After being gone for 8 days, a neighbor that lives about a block away saw the flyers posted around the neighborhood and returned Yoshi to his owners. "Yoshi" a 10 month old, 4 lb toy Yorkie went missing on Saturday, January 17th from his home at 198th Terrace and 89th Ave. His owner had just bathed him and had not yet reattached his collar when he escaped under their fence. Yoshi requires special food and medical supplements so it is imperative that he be found and returned soon. If you see him or have additional questions, contact Monica at 305-299-2359 or Mel at 786-233-0772. Monday, January 26th from 3:30-4:30 pm. Celebrate the Chinese New Year with stories and crafts. For ages 6-12. Saturday's starting at 10am-1pm. Receive free tutoring and homework help in science, math and reading. Call the library to sign-up. Friday, January 23rd at 8pm. The Rodeo begins with "Tough Enough to Wear Pink Night". Everyone, including attendees, are asked to wear pink to raise awareness for breast cancer research. Saturday, January 24th. Enjoy the free Rodeo Parade in Downtown Homestead. This parade features the newly crowned rodeo queen, floats, marching bands, horse units, clowns and more. Saturday and Sunday, January 24th and 25th, beginning at 2 pm, the rodeo continues with seven rodeo events, food, pony rides and a petting zoo for the kids along with mechanical bull rides. The Rodeo takes place at the Doc'DeMilly Arena at Harris Field, located at the corner of US 1 and SW 312 Street. Admission to the rodeo is $15 for adults and $5 for children 4-12. For additional information visit www.homesteadrodeo.com. Saturday, January 24th and Sunday, January 25, from 9:30 am-4:30 pm. Visit Fairchild Garden for their 3rd annual International Chocolate Festival. Learn how to make chocolate, discover the rich history of chocolate and most important, sample savory chocolate delights. Visit the Chocolate Spa and explore the rainforest to learn how chocolate grows. Enjoy lectures and children's activities. Admission is $20 for adults, $15 for senior citizens 65 and older, $10 for children 6-17, and free for children 5 and under. For more information visit www.fairchildgarden.org or call 305-667-1651 ext. 3344. Monday, January 19th, from 4-8pm. Local teams compete in a mechanical bull buck-off contest, along with Rodeo bingo and a charity auction. This event takes place at the Homestead rodeo grounds. Located at Harris Field, US1 and SW 312 Street. Tuesday, January 20th from 5-9pm. is Family Fun Night at the Harris Field Pavilion. Enjoy square dancing, a live bluegrass band and the "Lil' Britches cowboy and cowgirl contest. Friday, December 26 through Sunday January 18, your can recycle your Christmas tree by taking it to the Eureka Drive transfer station or a designated drop off location at the South Dade Landfill. Curbside recycling is available from January 7th-14th only. To recycle, remove all decorations including tinsel. Recycled Christmas tree chips will be available at the Eureka Drive station in late January. Eureka Drive Trash and Recycling Center is located at 9401 SW 184 Street. It is open daily from 7am to 5:30pm. The South Dade Landfill is located at 24000 SW 97 Avenue. For additional information, visit. You can also watch this video regarding the tree recycling program. On Sunday, January 18, from 2-4pm (arrive by 1:30). Take a cruise on the "Pelican Island Skipper", a 45-foot catamaran, as you explore the waters of Biscayne Bay. Learn about birds, sea mammals, Native Americans and early pioneers. The cruise is open to all ages at a cost of $35.00 per person. To reserve your space, call 305-235-1668 ext. 233. For more information visit www.deeringestate.org. Saturday, January 17th, from 4-8pm. Enjoy a free live concert featuring "The Fire Brigade" "18 Wheelers" and "the Dave Aaron Band" performing a variety of country and rock music. See Wyatt Earp Gunfighters perform. These events take place in Downtown Homestead at Losner Park (map). Friday, January 16th at 7pm. Visit the Deering Estate for the Living Artist Concert Series. General admission is $35. The event takes place at the Stone House Ballroom of the Estate which is located at 16701 SW 72 Ave. Phone 305-235-1668 for details. Saturday, January 17th and Sunday January 18th from 10am-5pm. Visit Pinecrest Gardens for their fine arts festival featuring nationally recognized artists. Enjoy music and entertainment, food and drinks, as well as children's activities. Pinecrest Gardens is located at 11000 Red Road, in Pinecrest. For more information, visit or phone 305-284-0900. Low Cost Health insurance coverage will be available to Florida residents beginning January 5th. To find out about the plan, visit coverfloridahealthcare.com or read the Miami Herald article at www.miamiherald.com/569/story/807244.html. On January 11th, from 10am-5pm, visit the University of Miami for the 58th Annual Beaux Arts Festival. This juried fine arts show features more than 250 artists. In addition, enjoy foods from many cultures, and an Art Park for children 5-12 that allows kids to create their own art while their parents stroll the festival. Admission is free, however there is a $10 per hour/per child fee for the Art Park. The event takes place on the University of Miami Campus, at Stanford Drive in Coral Gables. For more information, phone 305-321-1143 or email Morgan Smith. From December 9th through January 9th, the town will be providing bus transportation to residents who reside in our Senior Citizen communities. The bus (which is contracted through Palmetto Bay) will stop at various locations such as Old Cutler Town Center and Southland Mall. This service allows seniors an opportunity to shop, socialize, and participate in holiday activities. We would like to commend the Town Council for funding this project and encourage them to look for grants and other funding to continue and expand on this community service. January 10th from 11am-5pm. Join in the fun of the annual Redland Riot Road Rallye. This is a free event for car enthusiasts, tropical fruit lovers, history buffs and anyone who enjoys a leisurely drive through rural South Miami-Dade County. Participants start at Cauley Square, located at US-1 and 224 Street where they receive a map , driving directions, and a series of questions to be answered along the way. The event moves on to other homestead destinations. For more information visit, http://redlandriot.com or email rob@redlandriot.com. January 10th & 11th from 10am-5pm. Visit the Fruit and Spice Park for this annual festival featuring local arts and crafts, tropical plants, food, and children's activities including a petting zoo, pony rides, puppet and magic show, and Everglades reptile show. Admission is $6 for adults, free for children under 12. The Fruit and Spice Park is located at 24801 SW 187th Avenue. Homestead, Phone 305-247-5727. Thursday, January 8th from 7:30-8:30pm. Learn about the medicinal, ritual and practical use of plants in Miami. This free lecture takes place at the Deering Estate located at 16701 SW 72 Ave. Phone 305-235-1668 for details. On Tuesday, January 6th, at 7:00pm, the Cutler Ridge Concerned Citizens will have a presentation by Steve Zarzecki. He will be discussing "Old Cutler Road, A Brief History and a Vision of the Future". In addition, a representative from the Cutler Bay Police Department will be in attendance to discuss your concerns and answer questions. The meeting takes place at Cutler Ridge Park, which is located at 10100 SW 200 Street. This meeting is free and open to all Cutler Bay residents. Thursday, January 8 from 11am to 2pm. Visit Southland Mall for a free Senior Resource Fair. Receive free fire and life safety information, health screenings, promotional giveaways and more. Seniors 65 and older can sign up for the installation a a free smoke or carbon monoxide detector. Qualified applicants can also request a Dial-A-Life phone for use in emergency situations. Commissioner Katy Sorenson will give a presentation at 1:30. For more information phone 786-331-4920 or read the press release. Looking for activities to keep you child occupied this holiday season and beyond? Check out www.kaboose.com.